It was the first new vehicle I had ever purchased. And when I drove off the lot in my brand new 2003 forest green Chevrolet Silverado, I was beaming with pride. Never had I owned a truck so spotless. Before this, I sputtered around in a beat up Ford Ranger. But now, I cruised smoothly in a Chevrolet. I even got to take in that famed new car smell. I couldn’t wait to show off my new truck to my buddies. “Look!” I exclaimed as I pulled into my buddies’ apartment, “This truck is sweet.” And my buddies agreed. Of course, the three of us had to appropriately break in such a fine new vehicle. And so we ventured out on a ritual right of passage, precious to young men everywhere: the road trip. After all, there’s nothing like Slim Jims, Dr. Pepper, and several hundred miles to appropriately break in a new truck. In our reading for Palm Sunday from Mark 11, Jesus takes a road trip with His disciples to the city of Jerusalem. But instead of breaking in a new truck for His road trip, Jesus breaks in a new donkey: “As Jesus and His disciples approached Jerusalem and came to Bethphage and Bethany at the Mount of Olives, Jesus sent two of His disciples, saying to them, ‘Go to the village ahead of you, and just as you enter it, you will find a colt tied there, which no one has ever ridden. Untie it and bring it here’” (Mark 11:1-2). 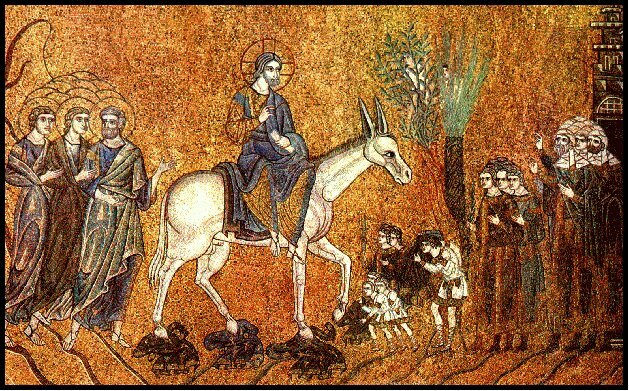 For this occasion, Jesus wants a donkey “which no one has ever ridden.” Two things are notable about this request. First, unlike a truck that has never been driven, a donkey that has never been ridden was no smooth ride, for the donkey wouldn’t have been “broken.” That is, it wouldn’t have been used to carrying any sort of a burden. Thus, the animal would have normally tried to buck any burden off its back. Jesus, however, seems to have no such problem: “When they brought the colt to Jesus and threw their cloaks over it, he sat on it” (Mark 11:7). There is no mention of the animal making any fuss whatsoever. At this scene, one cannot help but think of the kind of power Jesus has over creation. He can calm a storm (Mark 4:35-41) and whither a fig tree (Mark 11:12-14, 20-21). Nature submits to His command. Who is this? Even the wind and the waves, the fig tree, and a donkey obey Him (cf. Mark 4:41)! The answer to this question, of course, is that Jesus is the Holy One of God. He is God’s Messiah and, as such, fulfills the Isaianic promise: “The wolf will live with the lamb, the leopard will lie down with the goat, the calf and the lion and the yearling together; and a little child will lead them. The cow will feed with the bear, their young will lie down together, and the lion will eat straw like the ox. The infant will play near the hole of the cobra, and the young child put his hand into the viper’s nest. They will neither harm nor destroy on all My holy mountain” (Isaiah 11:6-9). Christ, as God’s Holy One, rules God’s creation and brings peace and rest to it – even to unbroken donkeys. This takes us to the second thing that is notable about Jesus’ request. Jesus’ request for an unbroken animal hearkens to the Old Testament sacrificial system, where unbroken animals were used as sacrifices to God. For instance, in Numbers 19:2-3, we read: “This is a requirement of the law that the LORD has commanded: Tell the Israelites to bring you a red heifer without defect or blemish and that has never been under a yoke. Give it to Eleazar the priest; it is to be taken outside the camp and slaughtered in his presence.” A sacrificial animal was to be unbroken and un-ridden. And so here we have an unbroken donkey. But this time, instead of being the sacrifice, the donkey is bearing the sacrifice. For Christ, just days later will be sacrificed on a cross. In the Old West, the cowboys had a saying. “Hold your horses!” they would say when an equine got out of control. On Palm Sunday, the cry rings out from the disciples: “Hold your donkey!” “Hold your donkey,” for the Savior needs it to ride into Jerusalem. And though it has never been ridden, it will not gallop out of control. For the Holy One of God is sovereign over nature – even donkeys. “Hold your donkey,” and do not give it to someone else, for this unbroken donkey will bear the sacrifice broken for sin…and sinners. What an honor it must have been for that donkey to bear the Christ. And what a blessing it is for us that our King has come to us “righteous and having salvation, gentle and riding on a donkey, on a colt, the foal of a donkey” (Zechariah 9:9). Entry filed under: ABC Extra. Tags: Chevrolet, Cowboy, Donkey, Ford, Horse, Palm Sunday, Ranger, Road Trip, Sacrifice, Silverado, Triumphal Entry.